The pack patch and segment program was developed to enhance unit pride and encourage participation by recognizing a Scout's attendance at various pack events. The use of small segments allows the pack to recognize more activities without greatly increased cost. The segments are approximately one-half the cost of traditional patches. The boys like it too which really is the bottom line. The program consists of the custom designed Pack 44 patch and segments (arcs) for various activities. The segments are worn in concentric rings around the pack patch. 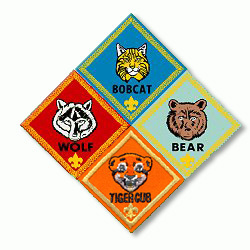 The pack patch is presented to each scout at the time that they join, usually as part of the induction ceremony held at the September pack meeting. Activity segments are awarded as the events take place. Some of the activities are open to all Cub Scouts, some are for Webelos only, and one can only be done by fifth grade Webelos scouts. The program was started in September 1994 for the 1995 program year. Scouts who were members at that time received a year arc to mark the start of the program. Year arcs are not given for subsequent years. The pack patch and segments cannot be worn on the uniform. Most of our Scouts wear them on a red patch vest, usually on the back where there is room for growth.